I couldn’t be happier that warmer weather finally seems to be here to stay for a while! When we got the request to give this art deco vanity a vintage glam makeover, I was over the moon. I love the lines and curves of art deco pieces – they remind me so much of flappers and The Great Gatsby. As we discussed the details of the project, our friend sent us a photo of her inspiration piece…and I’ll admit, I felt a wee bit intimidated. You see, I’m anything but a super glitzy gal. It’s rare that you’ll find me wearing lipstick or mascara, and even the idea of wearing earrings and a necklace at the same time overwhelms me a bit. I kid you not. So the idea of an all-metallic piece of this size kinda made me nervous, you know? The last thing I wanted was to create a piece that resembled a giant disco ball in the end 🙂 But I trusted my client’s vision and decided it was a good chance to step out of my comfort zone, so onward we went! First step: repairing and removing the peeling veneer. In some places, there were only loose ends to be glued back down. In others, the veneer was so warped that it had to be removed. The were lots of tiny wormholes and knots under the veneer than needed to be filled. It was time consuming, but well worth it for a smooth finish. We also filled the orginal hardware holes and drilled new ones for the gorgeous new drawer pulls she’d picked out. 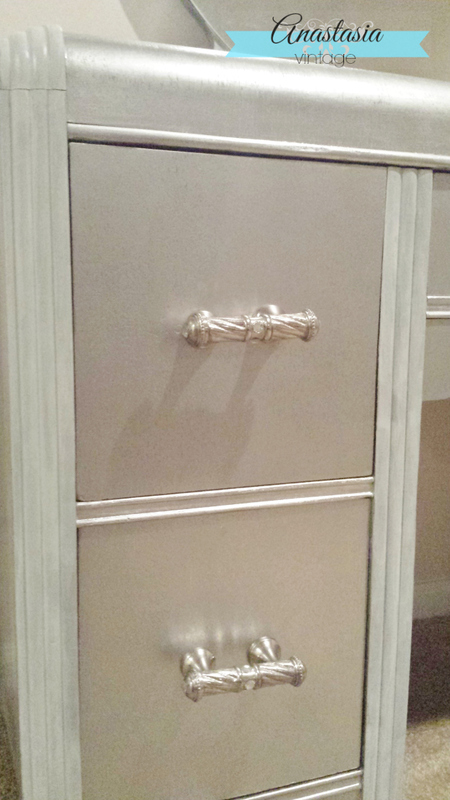 Once the piece was prepped and primed, I turned to one of my favorite paints, Rustoleum Metallic Finish in Chrome, for an authentic silver leaf look, but much faster, smoother, and with much less mess! My technique must have gotten much better since I last used spray paint – I was pleasantly surprised it only took just over two cans to finish the whole piece, mirror included, with great coverage. After adding the two-tone highlights my friend requested, the piece was sealed with two coats of polycrylic. Here it is, all glammed up! The pulls are the perfect finishing touch! What do you think? Are you into all-metallic furniture or just a few glitzy accents here and there?